Two cousins-in-law who came together to bring you Mamas Collective East. Why? Because we wanted to connect with other mamas in biz to share ideas, celebrate life and vent when we need to. Nobody understands what us mamas go through better than others in the same position. We use our knowledge and expertise in marketing and administration management to bring you the essential resources and tools that any modern business requires. We’re not business coaches nor business experts but ask us about the Facebook Algorithm; or linking Mailchimp to your Shopify account; or creating invoices through Xero; or finding your tone of voice… well that’s right up our alley! Together with local experts and other fabulous mamas in biz, we provide accessible, action-focused resources and tools to help your business flourish. Meet SAMMY - co-founder of Mamas Collective East, mama of 3, kids fashion addict, food lover and pretty much a jack of all trades. If you want someone to organise a catch up or find a yummy place to eat, Sammy’s your go-to. 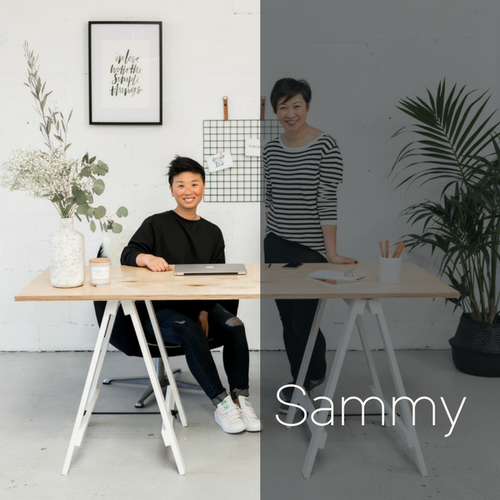 After working 7 years in Corporate HR in Melbourne and London, Sammy learnt that to get stuff done you need to work well with other people. Whether it be in your own team or with clients - it's so important to be on the same page. A great collaboration = M A G I C.
And skills learnt in any job can be transferred. "Don't be afraid to give things a go. I know I have learnt useful skills in previous jobs where I can add value in the next project but I'm always willing to learn new skills too. So if you want a change in career because this is where your passion lies, then GO FOR IT. Research, learn, talk to people - whatever it takes. If I never tried, I would feel more of a failure than actually giving it a go and then not work out"
Mamas Collective East is a combination of everything Sammy loves in her #workinglife - supporting people around her, seeing others learn & grow and building valuable connections. And why just local mamas in biz now? Because we get it. She can't wait to connect with everyone in the Collective; even better when over coffee or a glass of wine! Meet PHENIE - co-founder of Mamas Collective East, social media and marketing #girlboss, mama of 3, lover of good food and all things monochrome. Before starting her entrepreneurial journey, Phenie was a corporate marketer with roles in Event Management, a “Big Four” Ad Agency, and Sponsorship Marketing. She moved to Singapore after graduating uni with a marketing degree to pursue her career. She found herself thrown in the deep end, working 70-hour weeks to rise through the ranks to manage her own team in 3 years. After 6.5 years of slogging, she returned to her hometown Melbourne and continued her corporate life in marketing whilst running a small online business on the side (side hustle, y’all) in the gift industry with her best friend. Her corporate career ended soon after her entrepreneurial journey commenced and that’s when her love affair with small business started. Within this time, she married her life partner, embraced mamahood with two step kids and fell pregnant with her now youngest. Once her youngest was in kinder, Phenie knew it was time to revive her passion in marketing so decided to start her #dreamchaser with Sheek Marketing. Phenie encourages all women that have an entrepreneurial dream to just do it. Phenie loves the genuine connections of the community and can’t wait to see what the future holds for all the kickass #mamabosses.